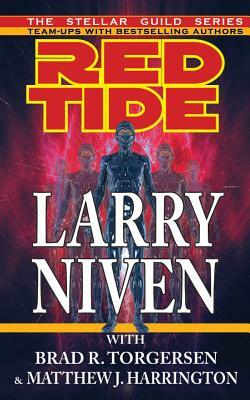 Loosely based on Larry Niven's 1973 novella "Flash Crowd," Red Tide continues to examine the social consequences of the impact of having instantaneous teleportation, where humans can instantly travel long distances in milliseconds. *** This is a theme that has fascinated the author throughout his career and even appears in his seminal work Ringworld, where the central character celebrates his birthday by instantly teleporting himself to different time zones, extending his "birthday." The author also discusses the impact of such instantaneous transportation in his essay, "Exercise in Speculation: The Theory and Practice of Teleportation." *** Larry Niven is joined by two younger writers, Brad R. Torgersen and Matthew J. Harrington, as they take on this challenging idea and further develop the theories and concepts that Niven originally presented in "Flash Crowd.